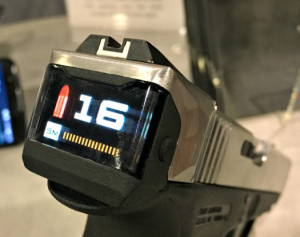 RADETEC SHOWS OFF SMART SLIDES AND GUNS AT SHOT 2019 (VIDEO) - Action Firearms and Accessories, Inc. Finally we were shown the Smart Gun. “We call it the Smart Gun because it recognizes the person who can shoot the gun and will only recognize that person,” Hemmerde told us. The gun has two lights, a green light which tells you the gun is safe and can’t be fired, and a red light which will only light up when the authorized person grabs the pistol. When the red light is active the gun can only then be fired. If the light system seems counter intuitive remember the company is based out of Spain.